When astronomers looking for new exoplanets planets gaze up at the tranquil night sky and wish upon a star, they’re really just wishing those stars would get the hell out of the way. That’s because, when it comes to looking for planets, light can be the enemy. Starlight tends to totally wash out the planets, rendering them effectively invisible. To filter out that light, a team of international researchers led by UC Santa Barbara physicist Benjamin Mazin developed a new tool called the DARK-speckle Near-infrared Energy-resolved Superconducting Spectrophotometer – A.K.A. DARKNESS (yeah, they probably did that on purpose). It’s the largest and most advanced superconducting camera in the world. With DARKNESS, astronomers expect to spot planets that reflect light 100 million times dimmer than that of the stars they orbit. This, the researchers say, will get them as close as possible to the theoretical contrast limit (the point at which their findings get distorted). Using DARKNESS, which is due for another round of testing and demonstrations in May, to filter out the light from stars will allow researchers to search for new planets in these Goldilocks or habitable zones – the just-right distance a planet has to be from a star to sustain life. Once these planets are spotted, researchers will be able to investigate them to look for signs of atmospheres or water. 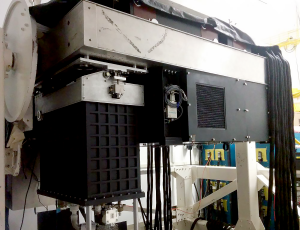 While we’re nowhere near ready to begin manned missions to distant planets, the new technology used in DARKNESS marks a paradigm shift from other telescope cameras that are unable to directly image these planets. In turn, this may help inspire an entirely new generation of technology for probing and examining distant stars.